In an effort to promote clean energy, New Holland has pioneered the use of biodiesel in agricultural machinery since 2006. They are currently researching more advanced technologies in this area. From 2011 Tier 4A emissions regulations will be a requirement for medium and heavy-duty engines above 174hp (130 kW). In response, New Holland intends to come up with solutions that make farming easier and more efficient while respecting the environment. 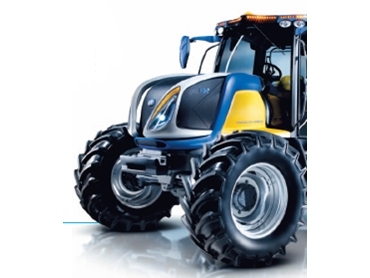 “We believe that a one size fits all approach doesn't work in modern farming,” explains Simon Vigour, Marketing Manager for New Holland Agriculture. As part of New Holland's Tier 4A strategy Selective Catalytic Reduction (SCR) technology has been adopted for machines with engines above 100hp and Cooled Exhaust Gas Recirculation (CEGR) for engines below 100hp. These solutions have been developed in partnership with Fiat Powertrain Technologies. They have already produced more than 150,000 Cursor and NEF engines that successfully use SCR technology. The technology has been continually developed and has resulted in a reduction in operating and maintenance costs, while increasing productivity and meeting emission requirements. SCR is an after treatment system that’s separate from the main engine function and does not compromise horsepower or torque in agricultural machinery. In addition, it actually improves engine performance. The additive will be available through the New Holland agricultural machinery distribution network and can conveniently be stored on the farm.